Are you stuck trying to figure out what type of hunting binoculars to choose for your outdoor game? For the purpose of clarity, binoculars are mainly two small telescopes that are joined together mechanically. You will find that on each of the telescope there is a large objective lens on its exterior, a prime focal length, a focusing unit, an exit pupil, and an eyepiece. Choosing the best binoculars for hunting is not an easy task. There are some essential features that you need to be aware of before buying your binoculars and you will find out exactly what they are if you keep reading this article. You need to be conscious that there are so many types of binoculars out there in the market. 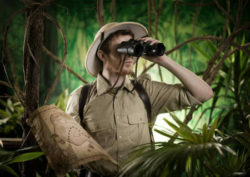 A good hunting binocular will enable you to see the environment and the prey very clearly even from a distant location. As an avid hunter, you ultimately need to have some specialized binoculars especially because you are likely going to work under low light conditions. As you go to the market in search of the best hunting binoculars, make sure that you pick a highly engineered hunting binocular which has the ability to produce sharp, bright and crystal clear images. However, to be able to pick these kinds of hunting binoculars, you need to take certain factors into account, and this buying guide was written to guide you through these factors and much more. What to Look for Before Choosing the Best Hunting Binoculars? This is one of the key important factors that you need to take into account when buying a hunting binocular. High-quality components are of the essence when it comes to hunting binoculars. A good prism will help you to view clear images when you focus targets with a pair of hunting binoculars. Basically, you need to be aware that there are two types of prisms available in the market, the roof and Porro prisms. Below is a briefing on how both the roof prisms and Porro prisms operate. 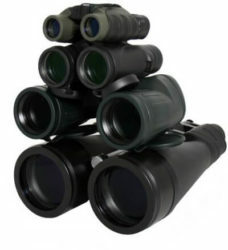 The roof prism binoculars are more compact and have straight optical tubes within. Between the tubes, there are two pivot points that are not easily adjustable to the user’s eye space. A roof prism will reflect the light up to five times. The resultant light will exit in the same manner that it came. The roof prism has a lightweight, slimmer dimensions, a compact build and its objective lens lies directly in line with its eyepiece. So when purchasing a hunting binoculars with roof prisms ensure that it is of a higher value. Do not be too economical because, from our experience, you get more when you pay more for these prisms. 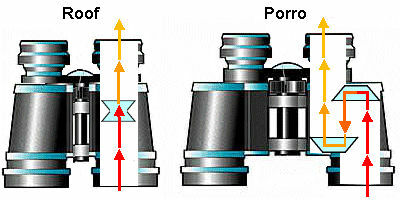 For Porro prisms, their objective lens is not in line with its ocular lens system. Their unique identification is based on the offset tubes. The distance between the front lenses is closer than that of those at the rear, but the reverse holds true for some models which are more compact. The design of this type of prisms is usually more superior than the roof prisms. They are very easy to adjust because they have a single pivot in between the two halves of the binoculars. However, it is important to note that we also have different types of Porro prisms. 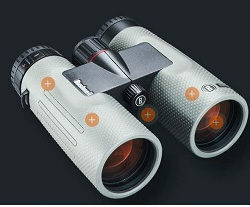 So look out for BAK-4 prisms Hunting Binoculars and the BK-7 binoculars. The BAK-4 prisms are the best as they produce crystal clear images by eliminating internal scattering of light. They are made of superior barium crown glass while the BK-7 prisms are made of the borosilicate glass. 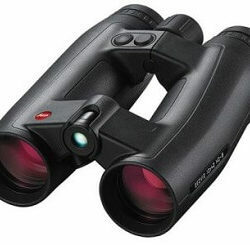 We recommend that you go for the BAK-4 Porro prism hunting binoculars. Check on the Lens Coating of the Binoculars. This is yet another factor that you need to consider carefully. The ambient light transmission in most binoculars is lost due to reflection while much of the light also unutilized in the binocular which resulting in poor contrast and glare. Always look out for hunting binoculars with a coated optical lens system to prevent the above-stated issue. Coated optical lens increases light transmission, reduces the loss of light, reduces glares on images and all of these sum up to crystal clear and brighter images. Check whether the coating is applied correctly and uniformly. Also, check if the effects are still fully intact. In order to make a good comparison of the types of coatings used in the construction of hunting binoculars, you need to understand what it means to have a coated optics. There are several ways in which the lenses of a binocular can be coated. fully Coated, multi-coated, fully multi-coated, and phase shift coated binocular lenses. Coated optics have one or more surfaces of glass coated with an anti-reflective optical coating. A fully coated optics has all the glass surfaces coated with the anti-reflective optical coating. A multi-coated optical system has one or more of the glass surfaces coated with multiple anti-reflective coating optics. A fully multi-coated system has all the glass surfaces coated with multiple anti-reflective coating optics. So, now that you have this basic insight, you should be able to make easy comparisons between the different types of lens coatings used in the construction of the binoculars. Check on Magnification Power of the binoculars. This is the one of the first and the major feature considered when comparing two or more models of virtually all the Binoculars manufactured in the world. 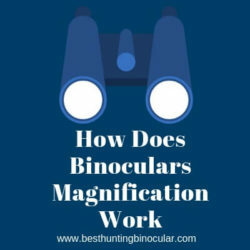 You need to understand very well, what the numbers accorded to the magnification power of a binocular mean in order to be able to make comparisons. You also need to know that hunting binoculars are highly classified according to the magnification power and the objective lens diameter. In the expressions (8×42 for instance) commonly associated with the magnification power of binoculars, the first number before the (x) refers to the number of times an object seems to have been brought closer than when using the naked eye. The second number after the (x) refers to the objective lens diameter. An important point to note is that a higher magnification power means that you are likely to have a narrower field of view. With this kind of magnification, you are also likely to find it difficult to stabilize the images since even minor movements will destabilize appearance of the images. Consequently, with a device which has a very high magnification power, you will have a smaller field of view which will also make it difficult for you to scout fast-moving animals in front of you. So to be able to choose the best binoculars for hunting you need to understand the terrain that you are going to hunt on to be able to pick the perfect match. If you like hunting in the woods, then choose some low magnification power binoculars for a wider field of view and more stable images. Also, check whether the binocular is able to gather enough light with its wide field of view. If your hunting environment is based on mountainous or wide open environments, then you need a higher magnification power so that you can be able to spot the prey from a distant location. Check on the size of the Objective Lens. The size of the objective lens is really important when it comes to hunting binoculars. This is because as a passionate hunter you are most likely to go hunting Under Low light conditions, that is during evenings and early mornings. So check on the type of binoculars that will make the image as bright as possible under these low light conditions. It is advisable to look out thoroughly for the lens with a larger objective diameter even though they are likely to be expensive. However, you can determine your personal preference from small, medium to a large objective lens. For a better hunting experience, it is recommended to choose an objective lens with an objective lens diameter of 42mm and above. Check whether the binocular is Fog proof and Waterproof. These are factors that will determine whether you will be able to enjoy your hunting experience in all weather conditions. When you are out there in the field, you are likely to encounter some irregular weather conditions. Check out whether the binoculars are well sealed to be able to keep moisture, dust, and any other foreign particles from penetrating into the lens. Another aspect you need to look out for in a binocular is whether they are sealed with O-rings and a casing that is waterproof. These are vital and play an important role in protecting the internal features of the binoculars. Check whether the binoculars are filled with nitrogen or argon gas to be able to withstand any element of Fogging that tends to occur due to fluctuating temperatures. Also, make sure that you check whether the binoculars are armored with rubber. This will certainly ensure that they are able to absorb shock and will give you a comfortable grip when handling them in any environment. 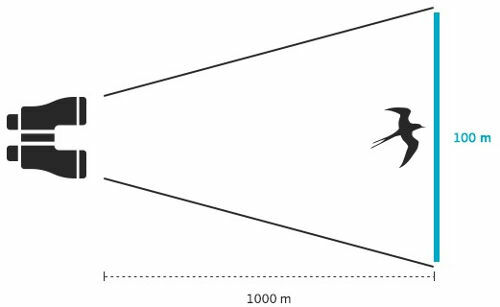 Check on the focusing system of the binoculars. Binoculars available in the market have one central focusing system or eyepiece focus. This implies that you will only focus on each tube using each eye. Here you need to understand that every time you focus on a moving animal as a professional hunter, you will need to change the adjustment position. One important thing to note here is that you need to set each eyepiece to allow for varied visions on each eye. Check whether it is simple to make these adjustments on the lens. Make the adjustments while focusing simultaneously at the same point in order to assess its performance after which you can use the center focus button to check whether it can be used to focus on both lenses. Check in the Field of View of the binoculars. This is one of the key factors to consider when evaluating any best binoculars. In fact, it is the second most used factor for binoculars. The field of view refers to how wide you are able to view with the binoculars. The smaller the magnification number, the wider or larger the field of view while a larger magnification number indicates that you will have a smaller field of view. For a hunting binocular, you need to look out for a wider field of view. This is because a larger field of view will enable you to view the environment clearly. You will be able to target your prey clearly whether in motion or a resting state. Check on the Exit Pupil. The objective lens diameter and the magnification power determine the exit pupil size. Check on the diameter of the exit pupil, this way you will be able to determine how much light will be transmitted to the eye. If you see a pencil(beam) of light, then that is the exit pupil. You can also compute the actual exit pupil diameter. You can do a simple math by dividing the front objective diameter by the magnification power of the binocular. A higher exit pupil diameter means that you will have enough light coming in and you will not be limited to what you can see even in low light conditions. Another aspect that you need to consider is your age. This is because as you age your ability to adapt to dim light also ages. So make sure that you evaluate this feature very well. Check on the quality of the material used in the construction of the binoculars. A good pair of binoculars should be made from quality optical materials as well as its construction mechanism should be of high class. This is one of the most important features in any binocular. Even though binoculars made from top quality materials are likely to cost you some extra cost, you will be guaranteed that you have an excellent binocular that suits your needs. High-performance binoculars cost a lot of money since they command a high level of expertise during construction and are likely to be lifetime investments. In order to assess the quality of the binoculars, you need to check on the prisms, type of glass, the design of the eyepieces, polishing and grinding elements of glass, the size and type of prisms, and the coverage and type of reflective anti-reflective coating system used in the construction of the binoculars. What we are saying is essence is, you need to check on the construction materials used in the construction of the binoculars. It is very important. Check on the lens barrels, the mounting of the lens and prisms, the finishing of the binoculars and the focusing mechanism. Also, consider where you are purchasing the binoculars from. Always buy hunting binoculars from knowledgeable and experienced providers who specialize in the sector. 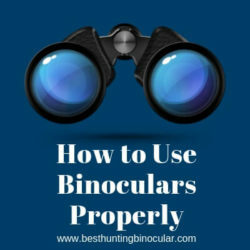 I believe that this detailed buying guide on how to choose the best binoculars for hunting has enlightened you a great deal. These are the key factors and features that you are supposed to put into consideration when purchasing a pair of binoculars for hunting. Assess the quality of the binoculars by evaluating the availability of the features discussed in this buying guide. I hope that you are now empowered with every bit of knowledge you need to purchase the best binoculars for hunting without breaking a sweat.